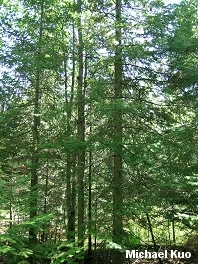 Growing in northeastern forests; needles flattened, in 2 rows, often curving upwards, not attached to pegs; young bark gray and smooth, with resinous blisters; cones 2-4 inches long. Habitat: In pure stands in swamps, but usually mixed when on higher ground; requires abundant moisture. Stature: 40-60 feet high; to 1.5 feet in diameter; narrowly pyramid-shaped. 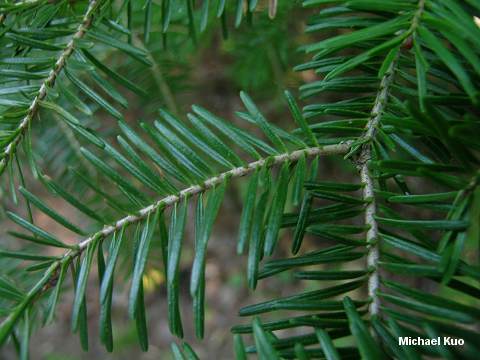 Needles: 3/4 inch to 1 1/2 inches long; dark green; vaguely grooved; in two rows; attached directly to branches, without pegs. Bark: Thin; gray; smooth but interrupted by frequent resin blisters, especially on young trees; eventually somewhat scaly, thicker, and reddish brown. Cones: 2-4 inches long; dark purple. Species of Amanita; species of Cortinarius; Gyromitra esculenta; Lactarius affinis var. viridilactis; and others.